The Classic Series Faceplates, with their sleek design, work in all single gang outlet locations. The faceplates also work with wall board adapters, raceway mounting brackets and standard size single gang junction boxes. The heads of the screws are color matched to the faceplate for a clean and consistent look for non-labeled versions. Classic Series Faceplates with Labels provide an aesthetic solution for complete identification. Other Classic Series faceplates can be labeled easily with modular labels. Dedicated sloped faceplates provide improve bend radius control ensuring standards compliance. Dedicated sloped faceplates with icon slots provide an alternative method for jack identification. Horizontally oriented faceplates work well with horizontally mounted T70 raceway. When using Panduit raceway and faceplates together, color matching is guaranteed. Faceplate dimensions Horizontal H x W x L = 0.22 x 2.75 x 4.50 in. Vertical H x W x L = 0.22 x 4.50 x 2.75 in. Packaging Supplied with two 1" long #6-32 screws and packaged 1 per bag, 10 per box. Bulk packages available, please consult catalog for part numbers. Faceplates are available with multiple module spaces for both vertical and horizontal applications. Each faceplate accept individual modules for both copper and fiber optic applications. 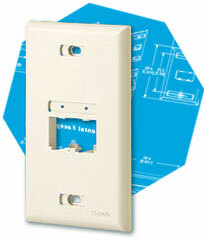 Faceplates are flush mounted with a clean look and be available with or without labels. Dedicated sloped versions are available for improved bend radius control and decreased requirements in wall depth.